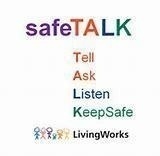 safeTALK is a three-hour training that will prepare participants to recognize and respond to situations where thoughts of suicide might be present. This training helps participants recognize signs of suicidal thoughts and invitations for help that are often overlooked. This training is designed for teachers, administrators and staff members serving young people in schools.